Hurricane Willa, a potentially catastrophic storm, swept toward Mexico's Pacific coast with winds of 155 mph, the National Hurricane Center said Monday. Forecasters expect the Category 4 storm to make landfall along Mexico's southwestern coast Tuesday afternoon or evening. 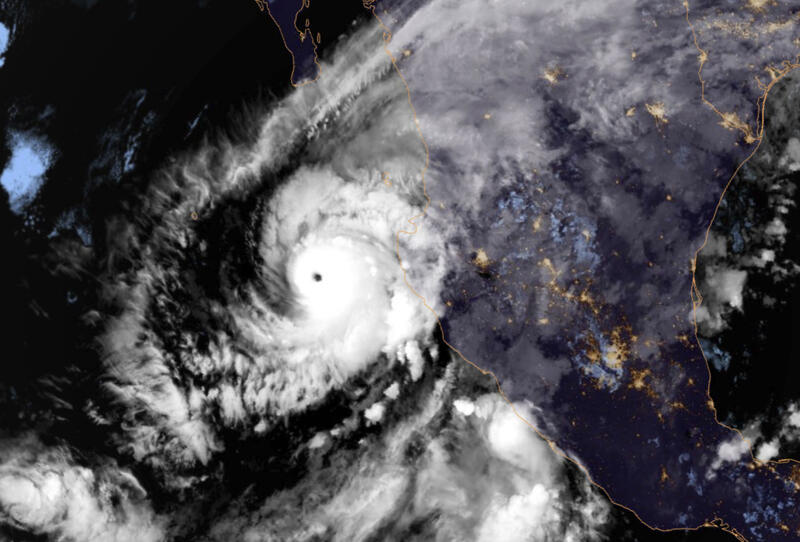 Willa is an "extremely dangerous storm" that is expected to bring life-threatening storm surge, wind and rainfall over west-central and southwestern Mexico, the hurricane center. After it briefly strengthened to a Category 5 storm, it weakened slightly Monday afternoon. Willa was located about 135 miles south-southwest of Las Islas Marias, Mexico, and some 110 miles southwest of Cabo Corrientes, Mexico, the hurricane center said in its 5 p.m. ET advisory. It was moving north at 8 mph. Enrique Moreno, the mayor of Escuinapa, said officials were trying to evacuate everyone in the village of Teacapan, the Associated Press reports. He said nearly 3,000 were affected but some residents would stay. In Mazatlan, Mayor José Joel Bouciegues said officials were preparing shelters and monitoring low-lying areas, the AP reports. The popular vacation town is home to a large number of American and Canadian expatriates. Forecasters said Willa was expected to produce total rainfall accumulations of 6 to 12 inches, with local amounts up to 18 inches, across portions of western Jalisco, western Nayarit and southern Sinaloa in Mexico. The rainfall could cause life-threatening flash flooding and landslides. Farther inland, Willa was expected to produce rainfall amounts of 2 to 4 inches across portions of Zacateca, Durango, southeast Chihuahua, and Coahuila in Mexico, with local amounts up to 6 inches possible. That could cause life-threatening flash flooding. After Willa makes its way across Mexico, it could drop between 1 and 3 inches of rain on central and southern Texas during the middle of the week. The additional rainfall could cause additional flooding in already saturated areas. Jeff Berardelli and Peter Martinez contributed to this report.